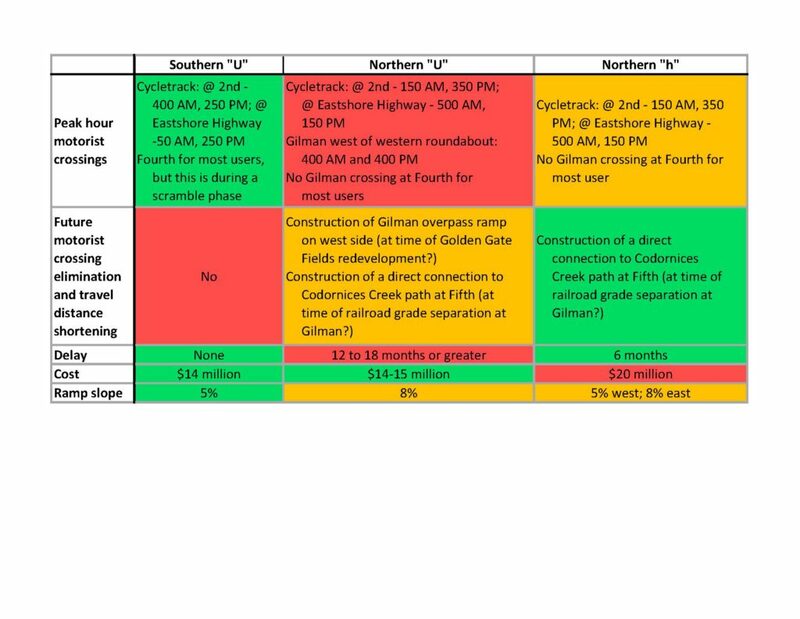 Under the wonderful leadership of Susan Chang, the project manager for the Gilman interchange project, the tradeoffs regarding different possible alignments for the Gilman overpass are becoming clear. While the tradeoff analysis is not yet final, the effort appears to have crested and is now rolling downhill. So it is a good time to share some of the preliminary findings and ask for your thoughts. Please share them by submitting a comment below this article in the hopes this page will provide a pan Albany-Berkeley conversation. The request to the Alameda CTC to consider northern alignments in addition to the southern alignment started with the surmise that there are more potential users north than south of Gilman. All data collection and analysis since has confirmed this. Below is a map showing biking and walking sheds north and south of Gilman according to routing by google maps to the Gilman fields. 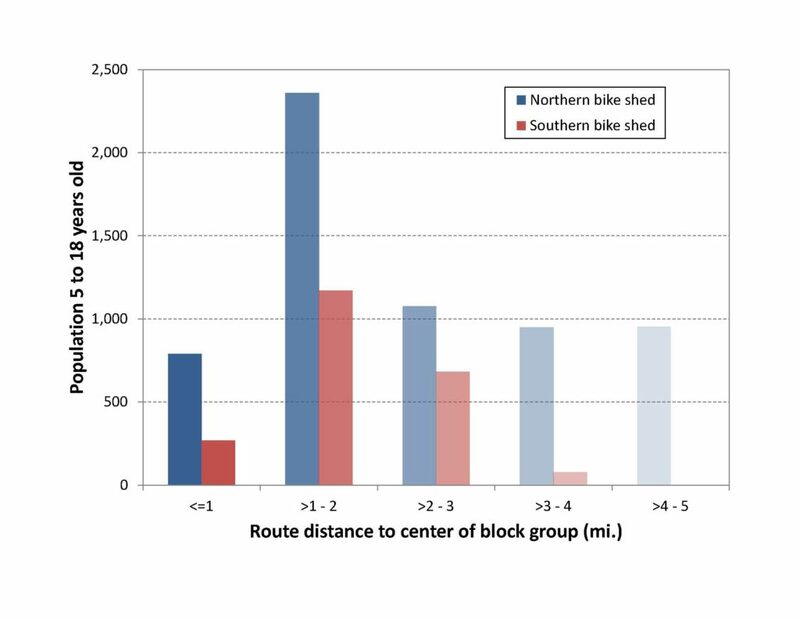 Whatever algorithm Google developed for cycling routes appears to accurately replicate the route most people would prefer (most people preferring low stress over high speed and directness). For instance it connects points south of University with the fields via the University active transportation bridge and the Bay Trail, and points west of San Pablo in southeastern Richmond via the Ohlone Greenway and Gilman. 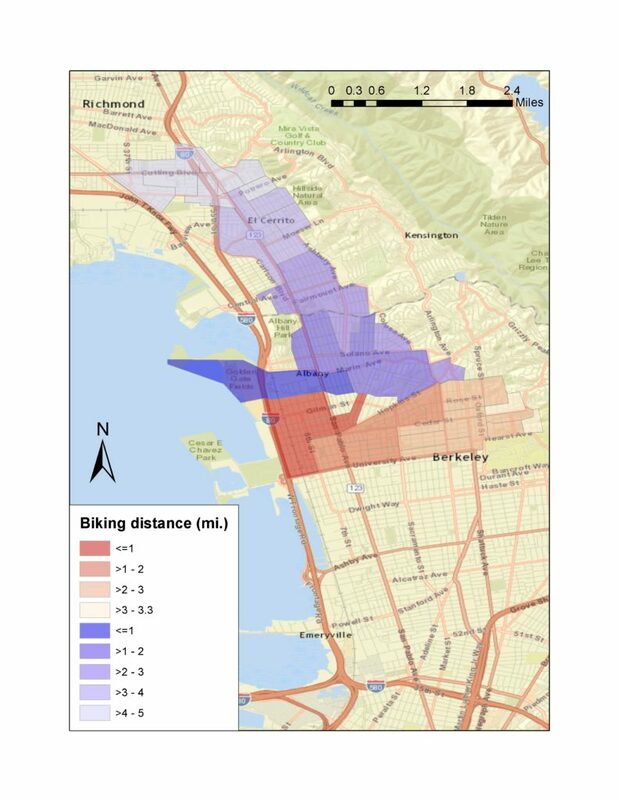 Note points in the hills are not included due to the much lower likelihood of people living there biking and walking to the waterfront. Following are population distributions by distance from the fields in each bike shed. After that is the distribution of 5 to 18 year olds. 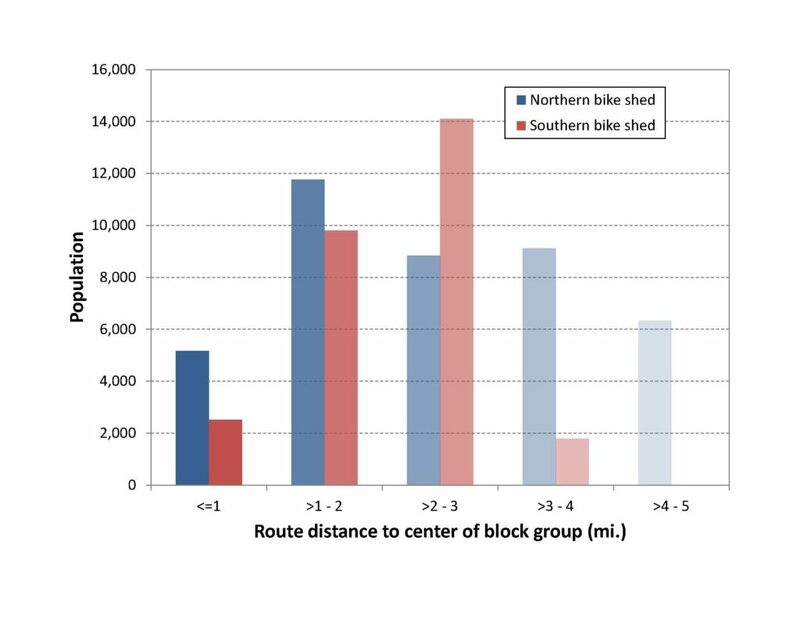 The columns fade toward the right of the chart to qualitatively indicate the decreasing the likelihood of someone biking or walking to the fields with distance. The charts show there are far more people north of Gilman than south at all distances other than 2 to 3 mi., and far more 5 to 18 years olds at all distances north than south. After discussion by the alignment working group, Alameda CTC also paid for maps of the home census block group of cell phones that visited the Gilman fields this past September. These data show that at least 7% of cell phones were from homes within 2 mi. in the active transportation shed north of Gilman and 3% south of Gilman. Two to three miles out, 4% were in the southern shed versus 2% in the northern shed. However the average elevation in the southern shed at these distances is substantially larger than in the northern shed. So in the context of roughly twice as much demand for the overpass from north of Gilman than south, what is the best alignment? The work group has considered something like twelve different northern alignments to date. Two have risen to the top at this time. Both of these provide for three potential options for making a connection with no motorist crossings to the Codornices Creek trail in the future. Neither makes that connection now because it would add at least $10 million dollars to the cost, be outside the project scope, and delay the project by years. The delay would result in Alameda CTC losing a grant for the overpass, and also risk that Alameda CTC would abandon its lead role on the overpass project. One of the two northern alignments of most interest is essentially a mirror of the southern alignment as shown on the map below. The other northern alignment is similar except it extends the western leg over Gilman to the midpoint between the north and south entrances to the fields. As part of either northern alignment the two-way cycletrack on Gilman west of Fourth would be on the northern side. There are a number of advantages and disadvantages to each alignment, summarized in the table below. 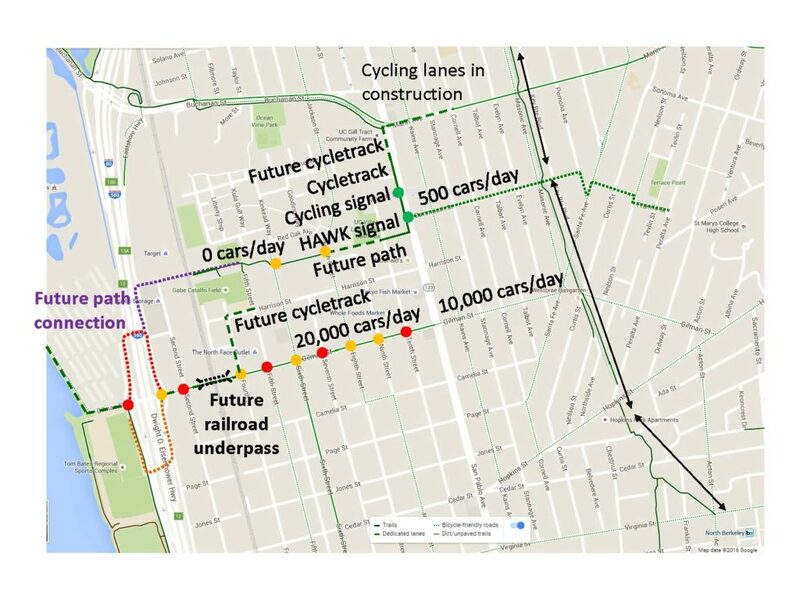 The matter appears to come down to the importance of accommodating a future connection that eliminates all motorist crossings west of Sixth, shortens travel distance on average, and avoids routing overpass users through a railroad underpass on Gilman if that is built. Red for the southern U below is based on considering these quite important. Whether it is important enough to prefer the disadvantages of each northern alignment is a judgment call based on the number of additional people that would use a northern alignment extending from Fifth and Codornices Creek to the Gilman fields without any motorist crossings in the future as compared to the southern U. Methods for analyzing active transportation travel demand are not sufficiently developed at this time to provide a quantitative answer. So what do you think? Please enter your thoughts in comments below. Thank you for offering an alternative to the dangerous crossing now at Gilman, and the proposal that would essentially (as I’ve understood it) send pedestrians and cyclists down to University Ave to cross to the Marina. Here is a real opportunity to acknowledge that humans on foot and bicycles should be accommodated – perhaps even before cars, though there may presently be more of them – in linking those of us living on the east side of the freeway with the natural beauties on the west. Thank you for the work done here. This is in line with Albany-Berkeley Soccer Club to connect with our community, seeing more families riding their bikes and walking to a game or practice is priceless. We took action to remove over 600 families off the freeway 4 years ago and this is another positive step that we fully support. Hi – Thanks for this summary of the trade offs. I also discussed the overpass with another community member who has been involved in these discussions yesterday. I think the Southern U makes the most sense. For me, this is an example of not letting the perfect be the enemy of the good. If we go for the southern U, we get the overpass sooner, for less money, and without steep grades. We also don’t have to come up with the extra money for the path connection and then bird dog the responsible agencies to build it out. That said, I recognize that with the southern U we will be forcing cyclists and pedestrians to cross at a busy 4th st intersection. Further, because that intersection is so close to the proposed roundabout, it can’t be signalized for the bike/ped crossing. So, as others have suggested, I think we need pull out every traffic calming trick we have to slow vehicle traffic through that intersection. Raise the crosswalks, narrow the street, stripe a green bike lane, post speed feedback signs, etc. To be clear, I’m not opposed to the northern alignments, I’m just not sure the juice is worth the squeeze at this stage.